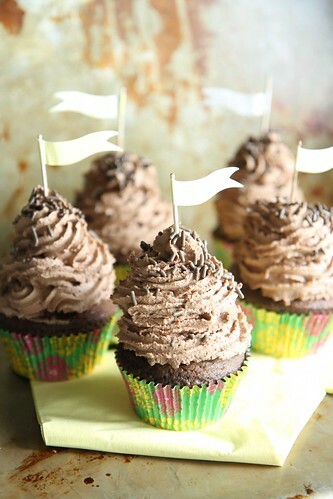 I am pretty much in heaven to be home, which is why I thought I would share these Chocolate Cloud Cupcakes with you. c) seeing cities that I have never been to before. I am busy celebrating what a great dad Pete has been lately, what troopers my little girls have been without their mommy and getting reaclimated with my real life after being one for a few weeks, so please forgive me the short post. I hope that these cupcakes help make up for it. 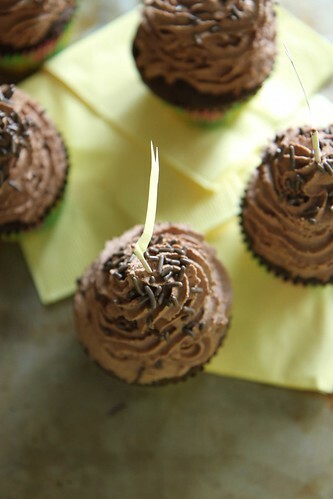 This is a variation on these dark chocolate cupcakes, but with a frothy chocolate whipped cream for the frosting. You will see why they have “cloud” in the name. I hope you like them! 1. Preheat the oven to 350 degrees. Prepare a muffin tin with 12 paper liners. 2. In the bowl of a standing mixer, combine the oil and the sugar. 3. Add the eggs one at a time as well as the vanilla. 4. In a separate bowl combine the flour, the cocoa powder, the baking powder and salt. 5. Add the dry ingredients to the batter and stir to combine. Add the milk and beat until you have a smooth batter. Fold in the chocolate chips. 6. Evenly distribute the batter between the 12 cups and bake the cupcakes at 350 for 18-20 minutes. 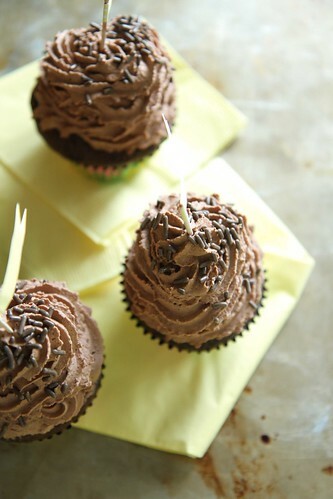 Let cool while you prepare the Chocolate Whipped Cream Frosting. 7. With an electric mixer, whip together the heavy cream, powdered sugar and unsweetened cocoa powder until you have stiff peaks. Frost the cupcakes generously with the Chocolate Whipped Cream Frosting. 8. Serve immediately or refrigerate until ready to serve. These cupcakes are heaven!! Wow! ha ha! thanks Julie!! I totally agree!! I am on cloud 9 with these fab cupcakes! These look incredible! I think I could eat the entire bowl of that fluffy frosting! Oh they look and sound scrumptious! These cupcakes look great!! Bet your family missed u bunches and are thrilled to have you home…..enjoy! These cupcakes look beyond fantastic! I mean look at that frosting. Beautiful! I just love that you were on BOOK TOUR!!! Your book is SO good. So proud of you!!! Oh yes, these are some incredible cupcakes! Oh, you. These are GLORIOUS!! Hope you are enjoying all of the comforts of home!